A quick note about my Mom's health situation. She's been home for the last three weeks. Every one of those days, two times each day, she had to go in to get antibiotic infusions. After a CT scan earlier this week she has been taken off all her antibiotics. Everything looks awesome, no sign of the infection, and things are healing up. She is now only on anti-seizure meds which she will be on for a while ... more out of precaution than anything. Thank you to everyone who had her in your thoughts and prayers. Day two was a transition day. We had a mid day flight to Yichang. In the morning the guide took some of our group to the temple we'd seen on our first day in Shanghai. Since we'd already been there we had a lazy morning sleeping in and having another good breakfast in the hotel. I had my first taste of Dragon Fruit here. The dragon fruit has a white pulp with tiny edible black seeds. The texture is similar to watermelon. People describe the taste as a cross between a kiwi and a pear. I definitely tasted the pear. The flavor is a little too mild for me - almost tasteless actually. We went to the airport and, as we were checking in the counter agent asked me where I was going. One of the perks of being on a tour is that transportation is handled for you. When the agent asked where I was going I came up blank. Didn't have the foggiest idea. Fortunately the guide was nearby and I discovered we were flying to Yichang. The two hour flight, flight number three of the trip, was uneventful. We arrived in Yinchang, picked up our bags, and boarded a bus. On the bus our guide taught us simple Chinese words. Ni Hao ... Hello. How to count from one to ten. She also showed us common one hand gestures for counting to ten. Not much of that stuck with me though I still have the handout she gave us somewhere. The bus arrived to the edge of the Yangtze river where we boarded the Yangtze Explorer. The four year old ship holds about 124 passengers but, since we were traveling in the off season there were only about forty or fifty people on board. After working for the navy for twenty years and riding several navy ships over that time, I'd developed a strong disinterest in taking cruises. I'd enjoyed our inside passage ferry cruise on the way to Alaska but I'd never really considered that a cruise. When we boarded my feelings were assuaged a bit by the rather informality of the ship and the large size of our room. All of the rooms had balconies, large beds, and a nice bathroom. Okay, we noticed something: The bathrooms on the ship (and in most of our Chinese hotels) had a large window looking from the shower area into the living area. They all had shades that could be pulled but it seemed strange and a little voyeuristic. Weird. 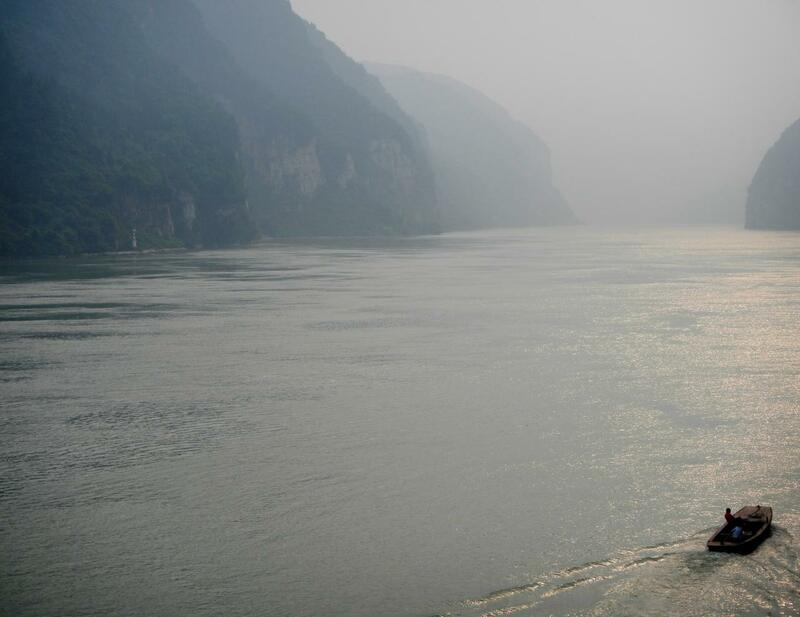 The hazy Yangtze river near Yincheng. We spent the late afternoon and evening exploring our new home for the next four days. As we ran into crew members, they would introduce themselves (their adopted English name). After one such encounter, as we were walking away, we could hear her repeating our names over and over as she memorized our names. The ship was proud of its personal service. A nice dinner (with some awesome desserts) and an introductory movie about the three gorges dam rounded off our day. The ship didn't set sail until the next morning. The ship had activities scheduled throughout the day. Day Three started early with Tai Chi classes at 7:00 AM. We'd taken Tai Chi classes before. The young crew member who taught the class was not as good as our teacher. She went through things a little too quickly. There was very little warm up (The class was only 30 minutes vs the hour we'd had). I remembered some of my class moves but it was hard to follow our new teacher. We ended up skipping the other two Tai Chi sessions. As we ate our awesome breakfast (The food aboard was incredible) the ship set sail and began chugging up the river. 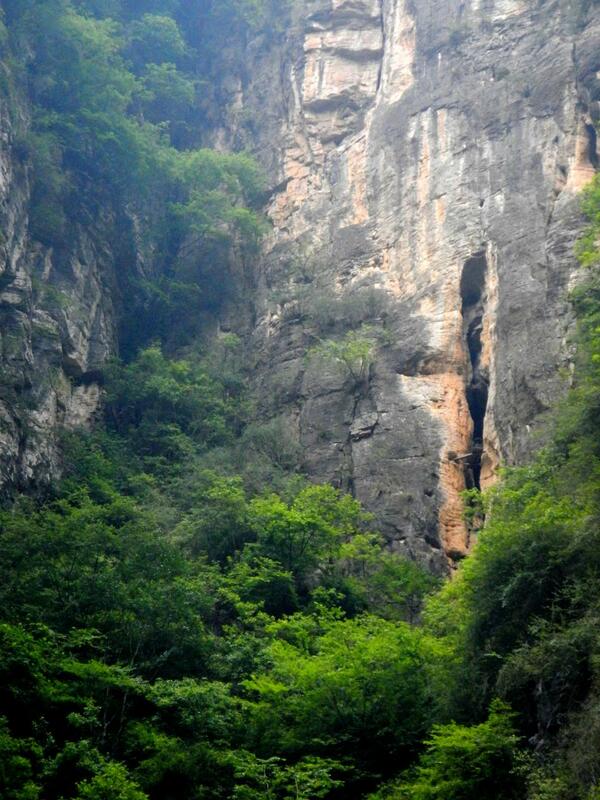 We soon entered Xiling Gorge, the first of the three gorges of the three gorges dam. This gorge, being down river from the dam, was the least disturbed when the dam was built. Sampans along the shores of the Yangtze river. As we went through the gorge a crew member top side pointed out the various peaks, towns, and other features along the river (I thought she kept pointing out the 'pigs' but she was saying peaks - crazy Chinese accent). The crew member, Jane, was very knowledgeable about the places along the gorge and its history. After exiting the gorges we approached the dam. We docked and we got on a bus that took us to a three gorges museum as well as a large memorial garden which offered a view of the dam. 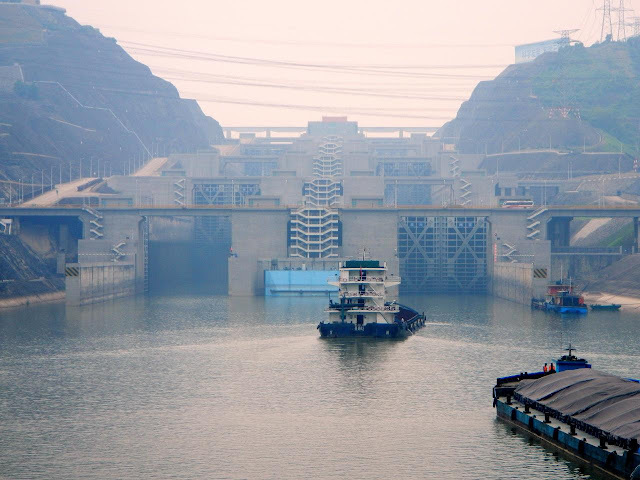 The dam, one of the largest in the world, generates electricity for a large portion of China as well as prevents flooding along the Yangtze river, something that occurred quite often before the dam was built. The dam submerged 13 cities, 140 towns, and over 1,600 villages along the river. All of these people were relocated to higher ground. While the numbers are impressive, the dam doesn't seem that big. I think, since you really can't get that close to the dam, it is hard to grasp its true scale. After our ground tour we got back on the boat, had lunch, and then waited our turn for the ship to go through the locks. As we waited we attended one of the classes/demonstrations offered by the ship. This one was about Chinese Reflexology (Chinese massage). Approaching the dam locks along with a few of our lock mates. After the demo I went topside to observe the transit through the locks. This was the first time I've ridden a ship through locks. It was pretty cool. The locks were huge. Along with our ship there were four barges in the lock. You probably could have fit six full barges in the lock. There are five locks, though, as the water level was a little low to accommodate the monsoon rains, only four were needed to raise the ships up to the level of the river upstream. The fit was so tight that you could reach out and touch the slimy sides of the lock. I left after we passed from the first lock into the second and went to a lecture and demonstration on Traditional Chinese Medicine. The Wife volunteered for some acupuncture while another lady did cupping. Our guide was a big proponent of cupping recommending it for everything from a cold, the flu, or just a long day at work. After the demonstration I would begin seeing the large, perfectly round bruises on the shoulders of people who had been cupped. After another good dinner we went to a "Cultural Cabaret". The show, put on my the ship's crew, started out okay but, when the Spice Boys started performing, we'd had enough and we went to bed. 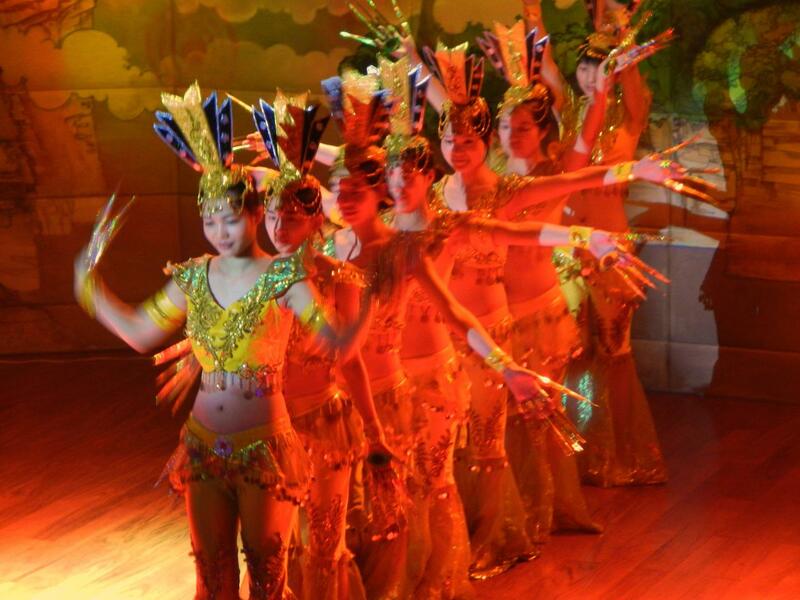 The Cultural Cabaret featuring the crew of the Yangtze Explorer ... a little too cheesy for me. Day four turned out to be one of the busier days of our cruise. The ship had docked the night before at Badong. (The view from our cabin that night.) 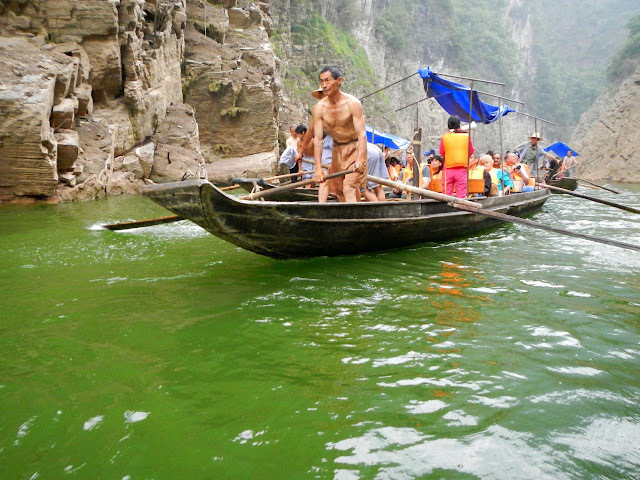 After breakfast we boarded a smaller ferry that took us up the Shennong Stream. 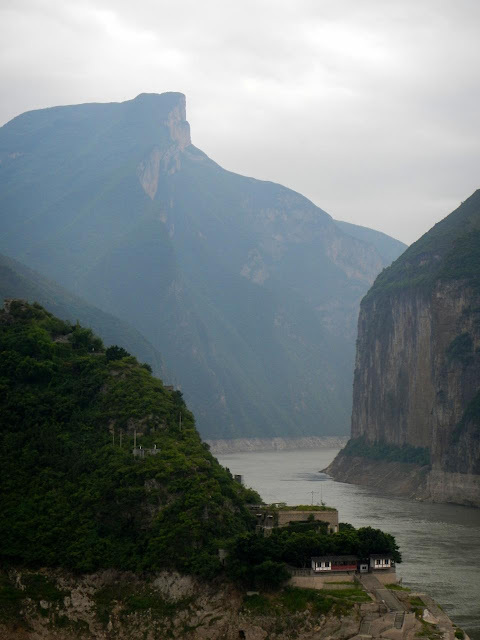 The "Stream", formerly a roaring rapids, was now a wide and very calm tributary of the Yangtze. The ferry took us along the steep cliffs and mountain valleys of the Long Chang gorge. On some cliffs we saw hanging coffins where coffins had been perched up on the cliff. Many of these coffins were relocated (mostly to museums) when the water level was raised by the dam. A Hanging Coffin seen in the lower end of the crack in the cliff. The vistas, marred only by the ever present haze, were spectacular. 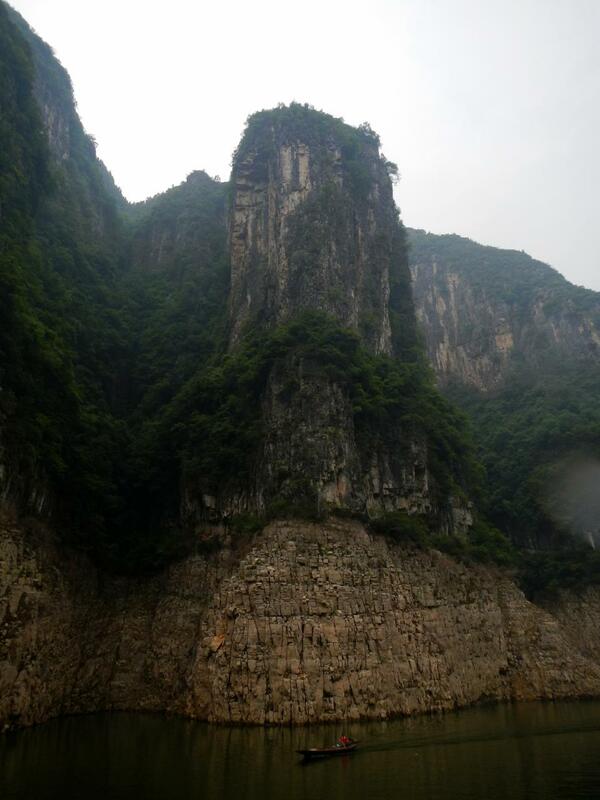 The views of cliffs, caverns, stands of bamboo, and more kept coming - the next view better than the one before. 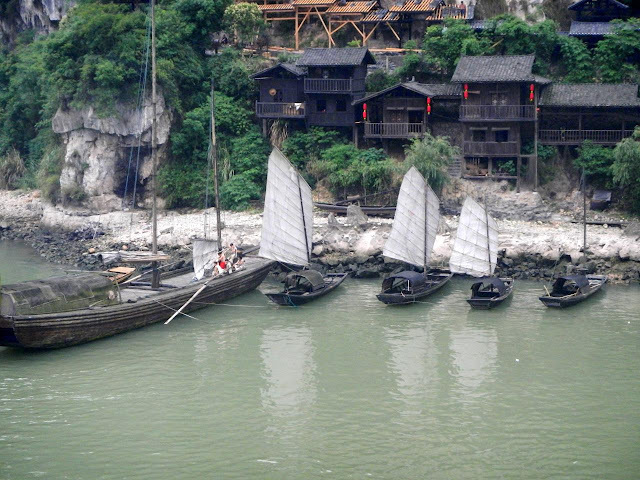 A sampan passes our ferry along the Shennong Stream. At the end of the stream, where it narrowed, we left the ferry and boarded a sampan. We were given a demonstration of how sampans once were pulled along the stream by men on the shore. (You can still see the paths the pullers would run along.) The sampan rowers were very competitive as we passed other boats full of sightseers. Some of their local festivals feature sampan races and our rowers had won a few races. We went up the narrowing stream for a while before turning around, returning to our ferry. A sampan with tourists passes ours. 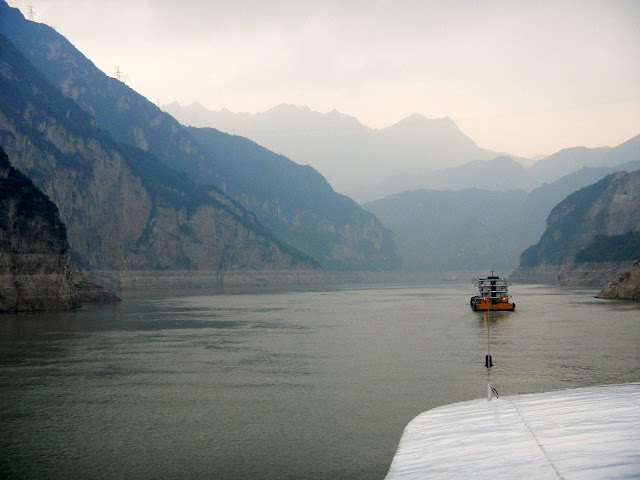 The ferry returned to the ship and we continued up the Yangtze passing through the other two gorges that make up the three gorges - the Wu and Qutang gorges. I was topside for both to listen to the crew commentary. You wonder what was submerged below the waters when the dam was built. The towns and cities you see along the shores now are all young ... less than ten years old ... even though they look like they've been there for many years. Think what you will about the Chinese, they know how to build a city very quickly. We docked at Baidi City where we took a bus to the City of the White Emperor. 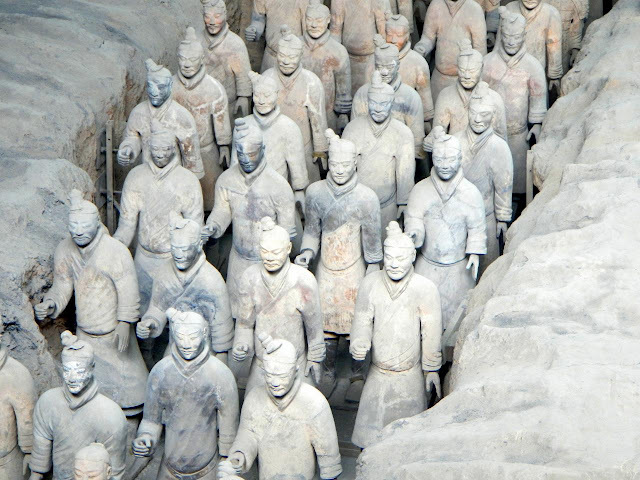 The city, built by Gong Sunshu during the first century AD, changed hands many times over the centuries and is now said to have been built by Liu Bei, described by our tour guide as the ruler of the "good" side during the Three Kingdom wars. The city and temple is perched on the top of a hill overlooking the intersection of the Yangtze and Mexihe rivers. We crossed a foot bridge and then climbed some three hundred steps up to the top of the hill. Many of the buildings here have been destroyed and rebuilt over it's 1,900 plus year history including during the cultural revolution - The Chinese have not been kind to their historical heritage. I ended up not taking that many pictures up here. Everything was beautiful but a lot of the interesting shots were in darker areas where my camera only captured out of focus shots. The one place we did take pictures of is a view of the Yangtze that is famous as it's on some of their currency. We fortunately got there and got our pictures taken before a large Chinese tour group showed up and crowded us out. Famous view of the Yangtze displayed on their currency. We returned to the ship tired and sweaty. We skipped the ballroom dancing, variety/talent show, and the music of the Stardust Duo, instead opting for dinner, a shower and an early bedtime. A very satisfying day of new experiences and sights. One of the better days in China. Pictures from days two though four (06/24 - 06/26/2012) can be found in my 2012-06 China Google Photos album. The first moon landing was on my sixth birthday. I remember some of it ... I remember a televised puppet show explaining the moon landing to the children watching ... myself included. On that day Neil Armstrong became the first human ever to walk on another heavenly body. He is one of twelve who have done so ... in the last forty-three years. Sad we could not continue what he started. He strides amongst the stars. 2012 Asian Adventure - Shanghaied! I think it's about time for me to tell you all about our summer vacation. This year, as many of you already know, the Wife and I went to China, Nepal, Bhutan, and India. It would be our most ambitious trip as a couple and it would also turn out to be an incredible experience. Our flight left early Thursday morning taking us first to Chicago before boarding a flight to Shanghai. The flight to Shanghai was 14.5 hours long, the longest flight I've ever taken to date. To my surprise the 14.5 hours went by quickly, possibly because of the two Excedrin PM I took part way through the flight allowing me to sleep through a lot of it. Possibly because of the book I took to occupy my time. Possibly the individual video screens we each had with a large selection of movies, television shows, and music to occupy our time. The two flights, the first two of the thirteen flights we would take on this trip, went incredibly smooth. the only incident was when the Wife's pants got caught on an armrest while exiting the Chicago flight and tore a hole in the leg of her pants. Not a major disaster but she'd bought the pants for this trip and it was the first ... and the last .... time that she wore them. We arrived in Shanghai around two in the afternoon. This was my first time across the international date line and I didn't really know when I was. Turns out I was in tomorrow even though I was really sure I was in yesterday. Very confusing. In China we were going to be with a tour group. After going through a rather painless customs process we met up with our guide, Malinda (She used an English name to make it easy on us), FD and ED (a couple from Virginia), and PT and KK (a Mother/Son duo from Utah). A quick bus ride got us to the hotel. Along the way Malinda pointed out buildings along the busy skyline of Shanghai. It was raining, foggy ... or smoggy ... most of the way to the hotel. It was monsoon season in this area of the world and I kind of expected the rest of the month would be like this - views through rain spotted bus windows. Turns out I couldn't have been wronger ... but I'm getting ahead of myself. 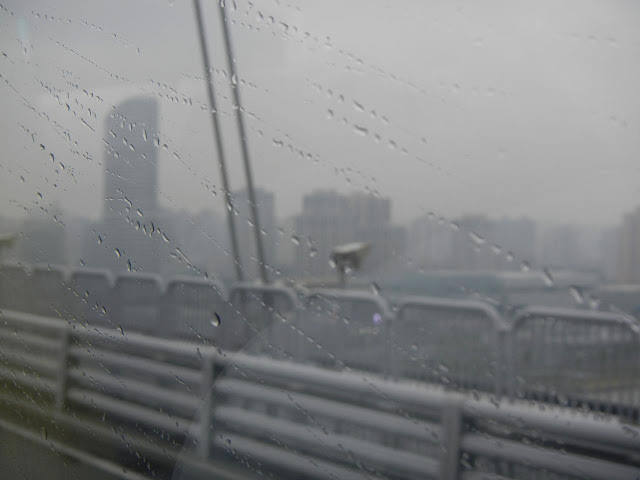 A Shanghai view through a rain spotted bus window. As we approached the hotel Malinda pointed out a Buddhist temple not far away and, since we had the rest of the afternoon and evening to our selves, suggested that we could visit it on our own if we wanted to. After checking in and settling into our room, and seeing the drizzle had stopped, we took Malinda's advice and headed to the temple. 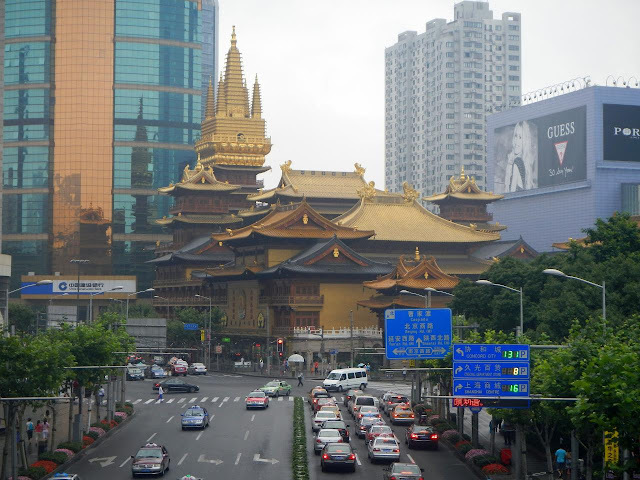 Jing An Si - The oldest religious site in Shanghai. 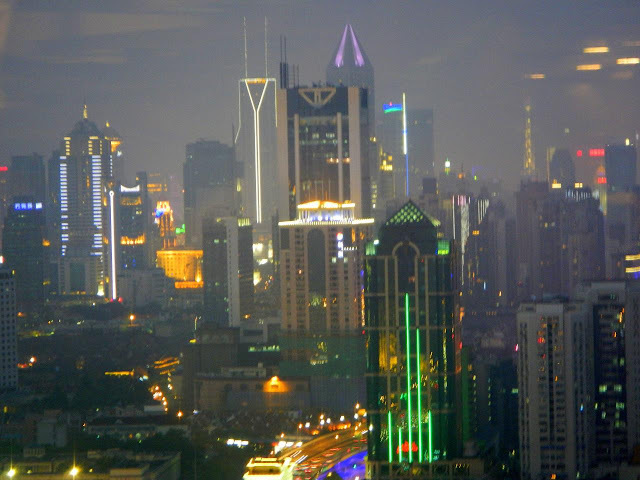 Shanghai is a modern city. There is new construction everywhere. The crane is said to be the national bird of China and the number of construction cranes sticking up amongst the tall buildings sure makes it obvious why. The hotel was on a busy highway but getting to the temple was easy with the rather massive crosswalk system they have on many of the intersections. Navigating the area was easy as most signs were in both Chinese and English. The city was in constant motion, not much different from New York, but there was this sense of scope that felt bigger than any place I'd ever been before (Shanghai, with over 23 million people, has about four million more people than New York). We reached the Jing An Si , the oldest temple in Shanghai, bought our tickets and explored the temple. We were ready to take off our shoes but we noticed that no one else removed their shoes. I think this is a result of China being a secular communist country - they have forgotten or actively disregard the old religious ways. The temple was beautiful and I took lots of pictures. 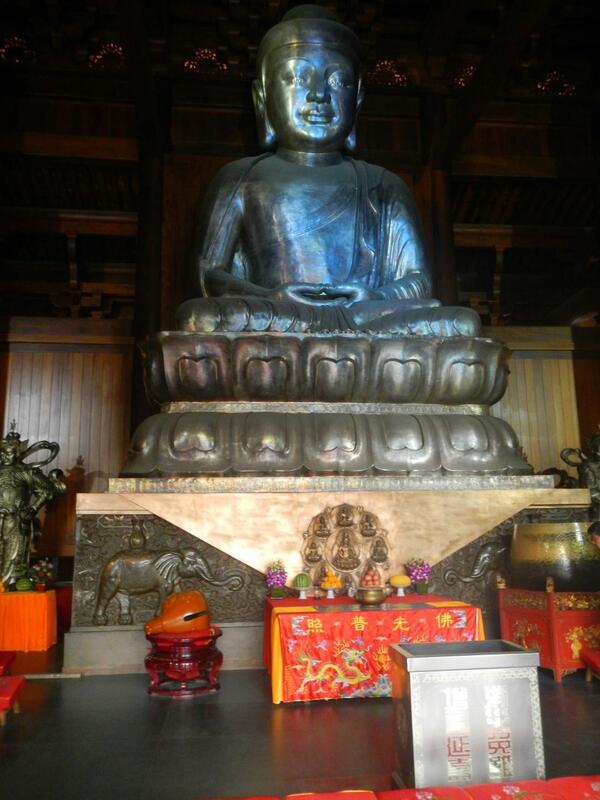 The show piece of the temple was a fifteen ton silver Buddha near the top of the temple. 15 ton Silver Buddha statue at the Jing'an Si. As we left we noticed we were among the last to leave - the temple had closed fifteen minutes earlier. We walked back to the hotel buying water in a store along the way. I noticed they had ice cream, Magnum brand, the same ice cream I ate in Spain - but the flavor was in Chinese. Didn't know if I wanted to buy it just to find that I didn't like the flavor (I was torn ... what to do?!? HA!). We ate dinner in the hotel. They had a pretty good Chinese spread. While they had western silverware I decided to see if I could handle chopsticks. To my surprise they turned out rather easy to use. The hardest thing to eat was rice. For the rest of the trip, in most cases, I preferred using chopsticks to forks and spoons. After dinner the wife went back to the room and I, following another suggestion from our guide, went up to the fortieth floor of our hotel to look at the city. It was still a little drizzly and the cloud/fog/smog layer hung low over the skyline. Shanghai's buildings are magnificent. They are all different and at night each one competes to be to most spectacularly lit. Even the elevated freeways are lit with blue light. The lighting and the haze gave the cityscape a futuristic yet dystopian air that reminded me of Blade Runner. Hazy Shanghai from the 40th floor of our hotel. The rest of day zero was spent watching television (CNN international, BBC, Al Jazeera, and a few channels in English with French or Spanish subtitles - an eclectic mix) and trying with mixed success to sleep. Our first full day in China started with a good breakfast buffet and meeting the rest of out tour group. Along with the four we'd already met we were joined by JQ, SH, SU, and NM from San Diego. We would meet the three remaining tour group members, JE, SE, and EM from Philidelphia, whose flight had been delayed, at our first tour stop of the day. Our first stop was the Shanghai museum. Readers of Homer's Travels may know that we are not museum people. After a brief introduction, our guide gave us free time and we toured the museum, starting from the fourth floor and working our way down. We went a lot faster than the others. 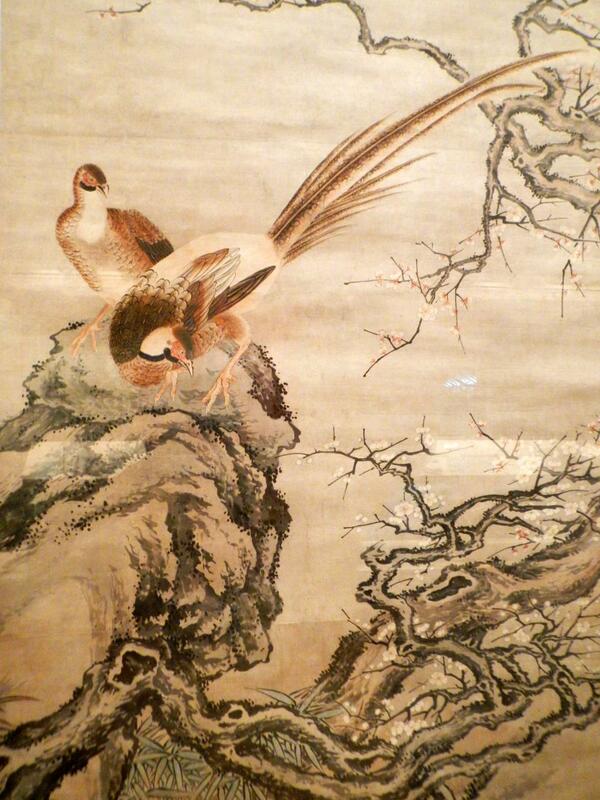 There were a lot of beautiful carvings, calligraphy, and jade. I think that's my issue with museums: there is too much to take in all at once and I just go into overload. We did manage to buy the first of many travel magnets here. 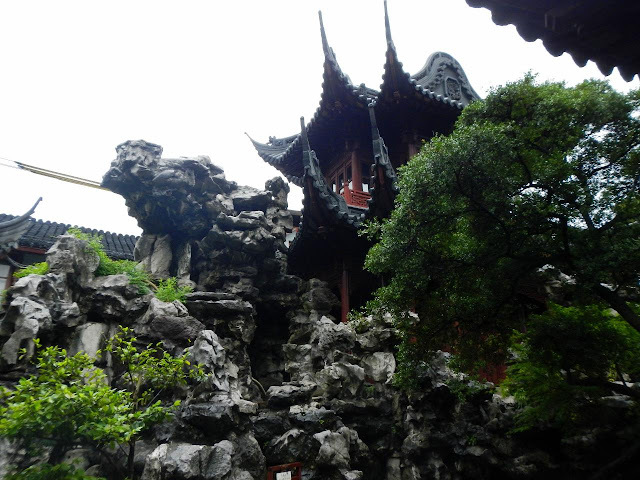 After the museum we went to the Yuyuan Garden. The bus dropped us off and we followed our guide through streets lined in shops and vendors. We reached the gardens and crossed the zig-zag bridge. The bridge is a zig-zag because the Chinese believed that ghosts could not bend their joints easily which made it difficult for them to turn corners. The zig-zag bridge helped keep out the ghosts. Another feature of Chinese architecture are high door thresholds. Ghosts could not bend their knees so they could not step over the high thresholds. The higher the thresholds the high the status of the home owner. The gardens were beautiful with intricately carved buildings, walls, and roofs. Lunch took us to a restaurant on the Bund. This restaurant was my first experience with a table lazy susan. The food was placed on the lazy susan and we each loaded our plates as we spun it around. It took some practice - you have to time things right so that dishes didn't get away from you. This is as good a time as any to talk about my food experience in China. In China our guide ordered most of the food. She admitted that it was Americanized Chinese food which mostly meant Chinese food with less spicy heat. I always found that I liked something on the table. There were a few things that were too spicy for my taste but in general I was fine. What was missed by many at the table is the lack of salt - food was a bit bland when the spice was reduced - and a definite lack of sweet. Most of their dessert were fruit plates. We ate a lot of watermelon in China. It was good watermelon but it wasn't chocolate. Many of the hotels which catered to the international traveler offered sweeter western desserts so we weren't too deprived. So my fears of having food issues in China, and the other three countries we would visit, turned out to be unfounded. I've come a long way. After lunch the rain picked up again and we walked to the edge of the river and looked at the Bund area across the river. 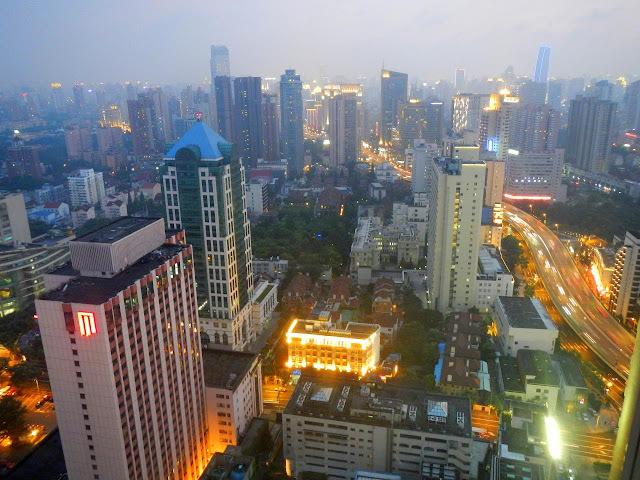 Despite it being a rather famous area in Shanghai, we really didn't spend much time there. I think our guide considered it too touristy and expensive. Our next stop was a silk factory where we learned how silk was made and where they tried to sell us expensive silk rugs and comforters. That is the cost of these types of tours. To reduce the prices tour companies make deals with factories - bring us your tours and we will buy you tickets for the more popular attractions in the city. It's a necessary evil ... and frankly seeing them spin thread from the silk cocoons was kind of cool. The afternoon ended with a trip to a more common shopping area - a popular area for the non-foreigners - in old Shanghai. The district had narrow, crowded ways that you could not drive down. The wiring above your head insured employment for the electricians. We walked around the area taking in the sights and smells (lots of restaurants) before we were given some free time to shop on our own. 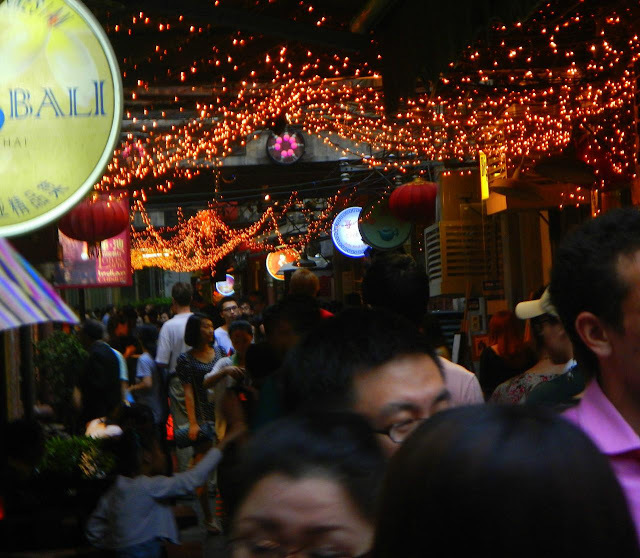 Crowded Shopping district of old Shanghai. Back to the hotel to freshen up and then we went back out to a dinner at a former slaughter house called the Bull Market. JQ and I successfully threw a dish off the lazy susan as we attempted to discover just how fast we could spin that thing. We got back to the hotel pretty tired. It was a full day. Everything was so new - a new country, a new city, a new language, a new group of people to make friends with, and a whole slew of new experiences. Shanghai was a perfect place to acclimatize ourselves to all the new stuff. There wasn't anything important to miss in your traveler's stupor but enough to make things interesting at a pace that let you make the necessary adjustments. Normally the tours start in Beijing. Beijing would have been too much on the first day. Shanghai was just right. I slept pretty hard this night though for some reason I would not wake up rested. That would take a few more days I'm afraid. Pictures from days zero and one (06/22 - 06/23/2012) can be found in my 2012-06 China Google Photos album. Ok, OK ... Here They Are Already! I've been a little distracted lately and have been slow in processing my pictures from our latest adventure in Asia. Based on the number of requests to see them, this delay appears to be irritating a lot of people. I usually only post pictures with the written posts but the number of request has convinced me to handle it different this time. 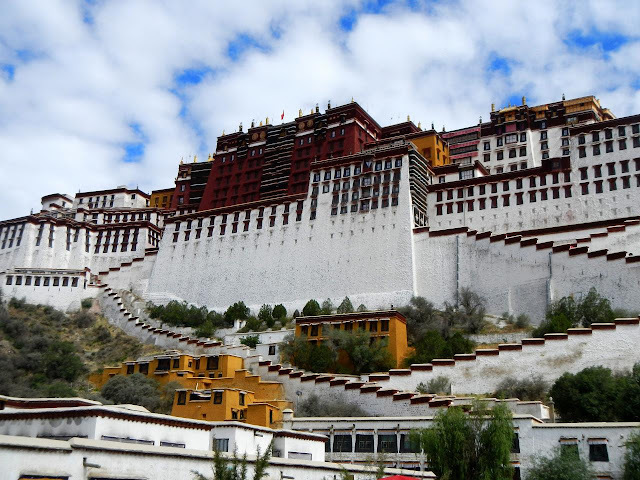 I have gone through all of our China pictures (Nepal, Bhutan, and India have yet to be gone through) and have posted them to my Google Photos account. Here is a small sample of the pictures I took. I reserve the right to reuse them to illustrate any future posts. Shanghai at night. The lights and the fog/smog/haze reminds me of the movie Bladerunner. Cruising up the Yangtze river on the Yangtze Explorer. The Potala Palace in Lhasa, Tibet. 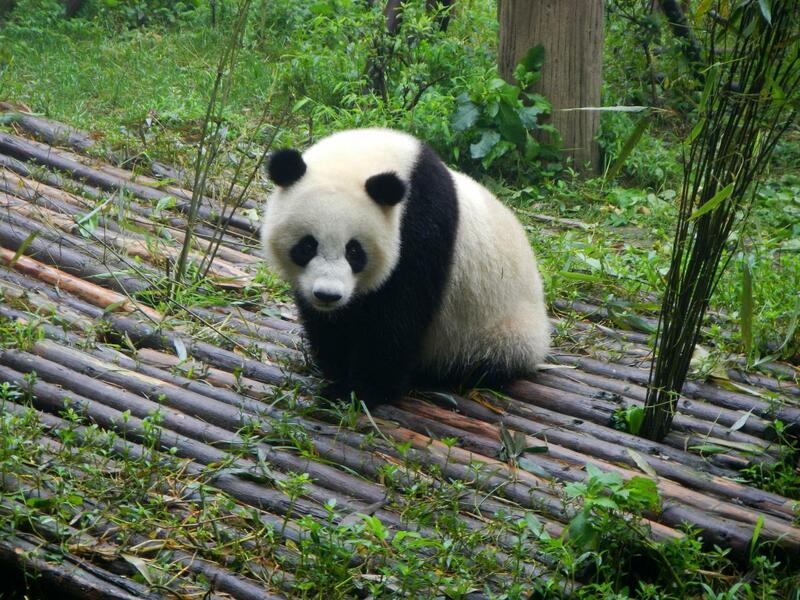 A Giant Panda at the "Chengdu Research Base of Giant Panda Breeding". The famous picture of Chairman Mao on the south gate of the Forbidden City seen from Tiananmen Square. 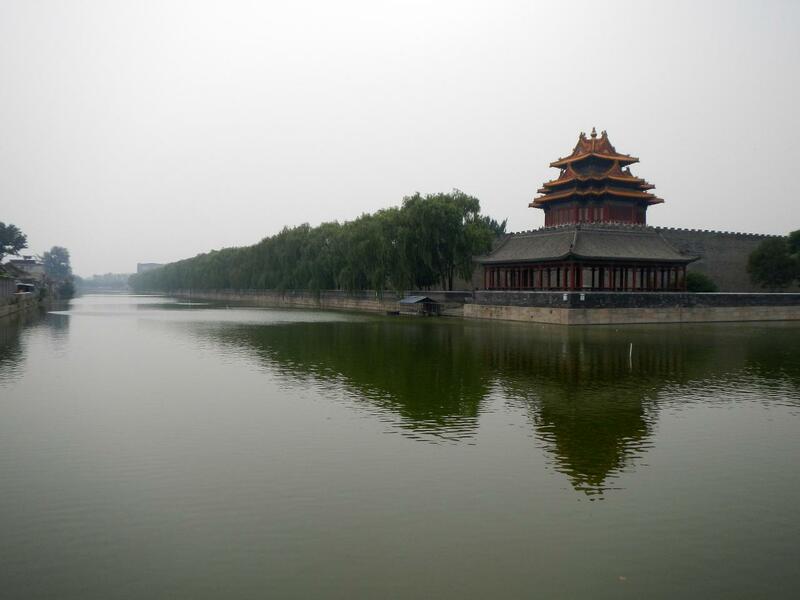 The outside of the Forbidden City seen from across the moat. 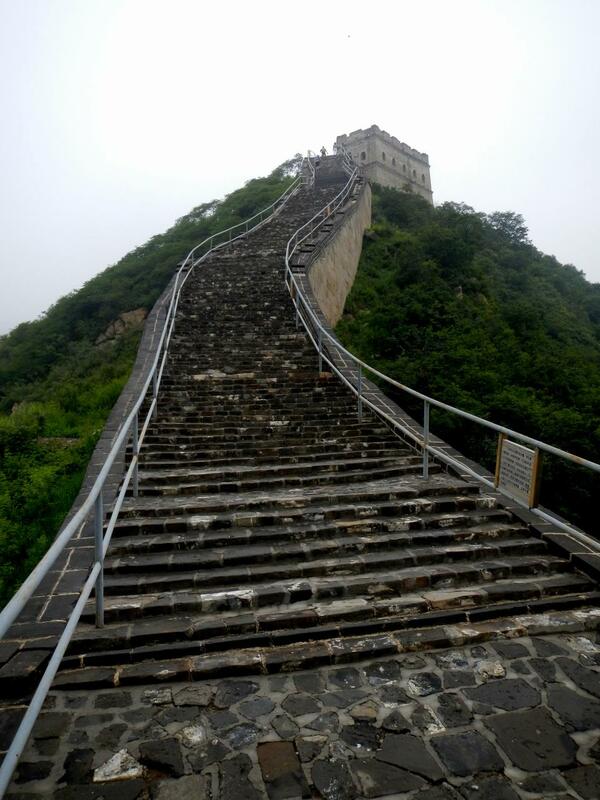 Up the stairs on the Great Wall of China. We nearly had this whole section to ourselves. I've upload 295 pictures I took in China, a representative sample of the 2,102 pictures I took in China and Tibet. 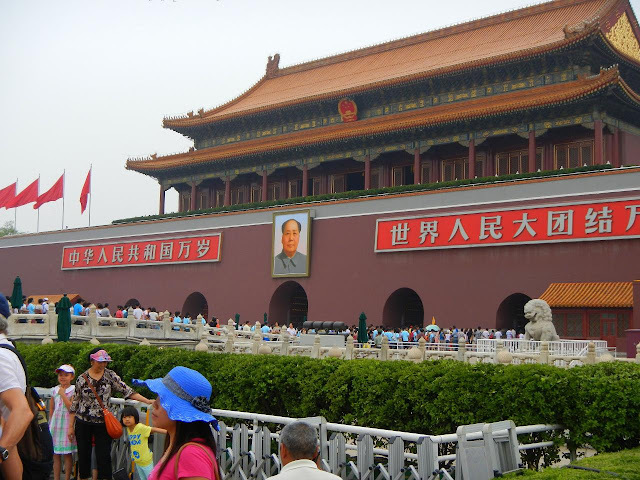 You can see these in my 2012-06 China Google Photos album. I hope to start posting about the trip sometime next week. My Mom is in the hospital. Her husband, ER, took her to the hospital early Thursday morning when she was having difficulty speaking. While checking her in she had a seizure. If you're going to have a seizure then the hospital is the best place to have it. She was immediately sent to get a CT scan and a mass was found in the left, frontal lobe of her brain. Over the past four days there have been several theories: tumor, malignant tumor, or an infection. They put her on anti-inflammatory steroids and anti-seizure medications. We were woken up early Thursday morning. When we got to the hospital Mom wasn't quite there. She was confused and her speech was slurred. She had trouble remembering things that happened five minutes before. Over the next forty-eight hours the drugs did their job. The improvement was tremendous. Her slurred speech returned to normal. She still doesn't remember much of last Thursday. That may be a result of the seizure, the medication, or both. By late Friday she was sounding like herself and her memory had returned to near normal. We all spent the weekend, Mom and ER , the Wife and I, Mom's brother and sister, all of her friends, holding our collective breaths. The biopsy/mass removal couldn't come soon enough. This morning they finally went in and removed the mass. Of the three possibilities discussed, the reality turned out to be the most benign and treatable: it was an infection. They cleaned it out and removed the cyst wall. She is on antibiotics. Where did the infection come from? That's one of life's little mysteries. Every now and then life shakes you up and brings you back to reality. This was one of those times. Fortunately for Mom, it was gentle shake.